Note: This is the second of two posts recounting Eye on the East’s recent visit to Athens. Part one can be found here. It’s hard to believe that less than two months ago, Greece was on the verge of exiting the eurozone and forcing the European Union to ask serious questions about its own viability. Today, Athens’ social, political and economic battles – under the vigilant eyes of its creditors – no longer make the international headlines, but they are only just starting to be fought. During a short trip to Athens in June, there were only two things on people’s minds: financial collapse and the long-awaited concert of British pop rocker Robbie Williams. After I attended the Williams concert and got that out of the way, there was nothing else to talk about other than the crisis: whether banks would collapse, whether people would be putting their old drachmas back to good use and whether there was reason enough for Greeks to be worried for the future and that of their families. Who’s fighting who? 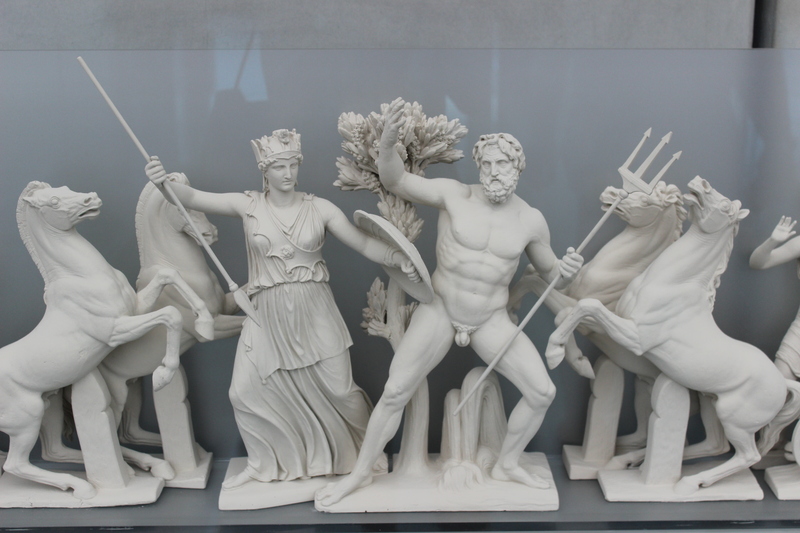 – A miniature reconstruction of the Parthenon frieze depicting the battle between Athena and Poseidon, on display at the new Acropolis Museum in Athens. Credit: Marina Chamma. It has taken me far too long to synthesize and make sense of a financial and political crisis with more twists and turns than a Latin American soap opera. But when you bare the crisis of the trillions of euros and the political struggles, I think it boils down to two simple and basic things: first, for a party like Syriza to come to power means that Greek democracy is as healthy as ever. Unlike other countries, Greece may claim the right to export democracy if it so wishes, and why not, it could even make money out of it to increase government revenues. And second, don’t expect much of a democracy when you’re indebted all the way up to your ears.